After winning the WBO Junior Welterweight Championship by stopping heralded tough guy and incumbent title holder “Mile High” Mike Alvarado in the reigning champ’s hometown of Denver, Colorado, on October 19th of last year, most fight fans would have guessed that big fight opportunities would be easily attainable for undefeated Russian native Ruslan Provodnikov in 2014. With sledgehammers for fists and an iron chin to match, the irresistible force at 140 pounds always displays violent drama in the ring whenever he graces the light blue canvas…the kind that brings enthusiasm to arenas and excites fight fans around the world. The 30 year old champ represents the kind of warrior that most avid boxing enthusiasts are willing to support. So with a fan friendly style and a piece of coveted hardware around his waist, why is the HBO featured title holder still searching for a suitable challenger? Ruslan’s promoter, Artie Pellulo, believes that most fighters in and around his Junior Welterweight champion’s weight division understand the obvious dangers in facing a competitor like Provodnikov. 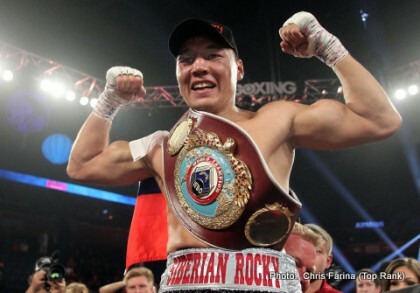 On March 16th, 2013, Provodnikov made his HBO debut against two division world champion and pound for pound fighter Timothy Bradley for the “Desert Storm’s” WBO Welterweight title. Despite being a 5 to 1 underdog going into the championship bout, Ruslan made his presence felt early in the fight by staggering the customarily granite chinned Tim Bradley in the closing seconds of the opening round with a perfectly timed overhand right. Although Provodnikov eventually received the short end of a controversial unanimous decision verdict, the hard punching challenger floored the heavily favored fight veteran in the twelfth round and arguably decked Bradley two additional times without receiving credit for the knock-downs from referee Pat Russell throughout the contest. Directly following the entertaining war of attrition, the declared winner had much to say about his hammer fisted opponent. Despite losing his first big title opportunity, it was obvious to everyone who had witnessed the eventual “Fight of the Year” for 2013 that Ruslan Provodnikov had officially arrived. The newly crowned WBO title holder truly enjoyed a break-out year in 2013, and looked very impressive in both outings against two respected champions; even in controversial loss. Perhaps a little too impressive. Although there was brief discussion between Banner Promotions and Top Rank, Inc, concerning possible PPV bouts with both Manny Pacquiao and Juan Manuel Marquez respectively, the two legendary fighters elected to entertain other offers. Pellulo believes that the best at 140 and 147 pounds can run, but they can’t hide.